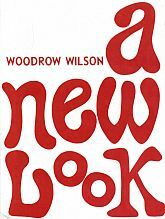 The pictures are as represented in the Woodrow Wilson High School, Portsmouth, Virginia yearbook or annual of the year indicated on the page. The Memory pictures may not be complete and pictures and names may have been removed by request of the person involved. Also, it does not offically indicate the year of graduation and/or that the party in question graduated. 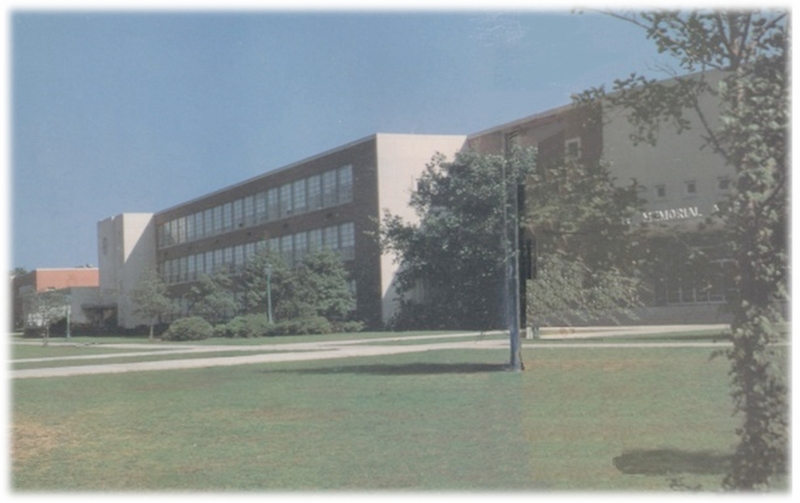 This section of the website is dedicated to the memories of all alumni and are found in personal items that alumni have saved and were kind enough to allow it to be shared with others. Thank You. If you are not represented in your class, or have other pictures for the memories section you may submit a photo to be added. John “Eddie” Lee ’68. All the pages in this section of the website may take tme to load as it is made up of pictures and graphics. Every effort has been made to make them as small and fast loading as possible. 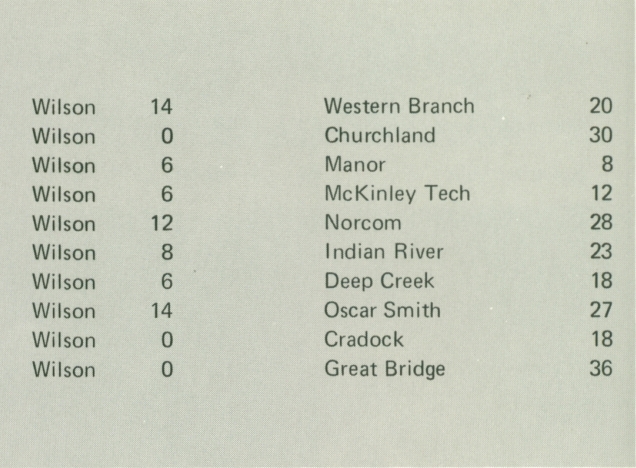 This was the year of a new head football coach as well as a winless football team. The girls' basket-ball team also received a new head coach. Also, both the Varsity and Junior Varsity cheerleading squads were enlarged. CLOCKWISE: Quarterback Curtis Franklin throws a pass toward the tight-end in the McKinley Tech game. Greg Taylor anxiously watches an important race. 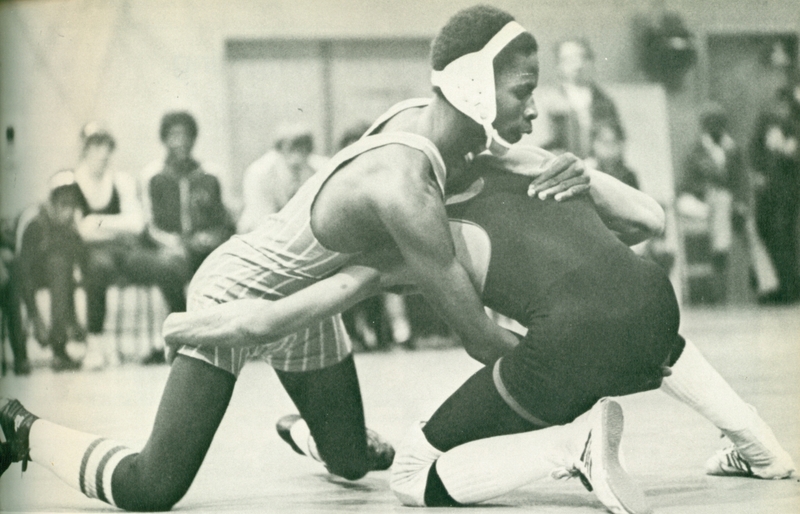 Michael Folston moves in for a take-down against his Manor opponent. Bev Owens banks one for two points. The Offensive and Defensive Backfields. 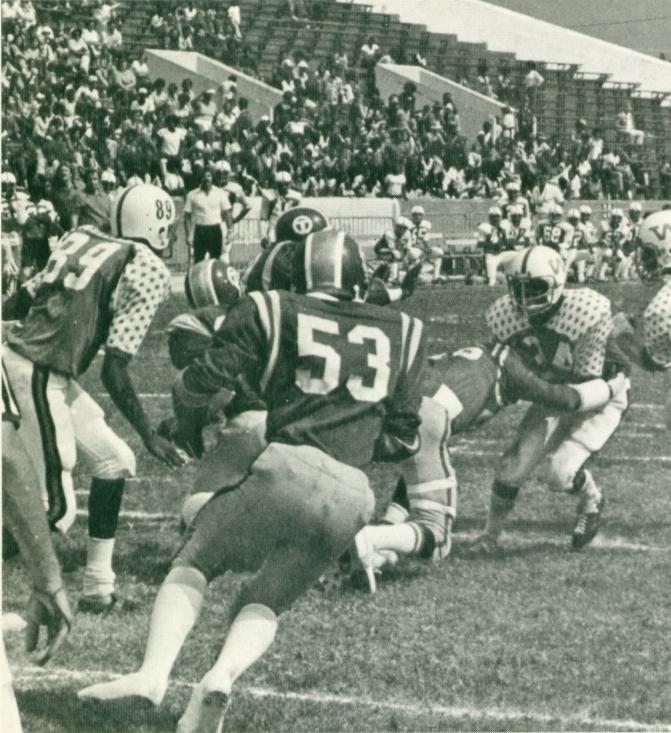 Some of the key players were tri-captains George Brooks, an offensive and defensive tackle; Reggie Williams, a fullback and line-backer; and Charles Goosby, a halfback. Assisted by numerous other gifted players, the team was involved in practically every game until the last few minutes. Although plagued by count-less injuries, the team played vigorously and showed excellent sportsmanship throughout the 0-10 season. Russ Collins attempts to gain vital yardage against McKinley Tech. Daryl Howell finds it troublesome to get a first down. James Sumner warms up before game time. Kevin Banks receives a hard blow from a Trainer. 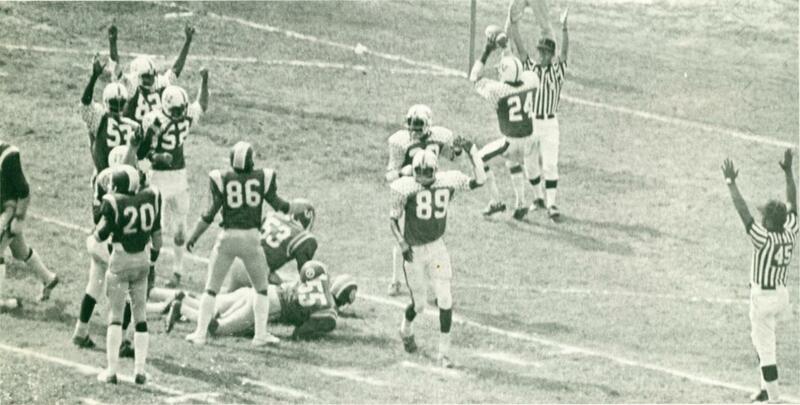 The ecstasy of a touchdown! Gaining experience for future years, the Junior Varsity Football Team had a very impressive season. Compiling a 4-1-2 record, the team proved to be the most successful in several years. 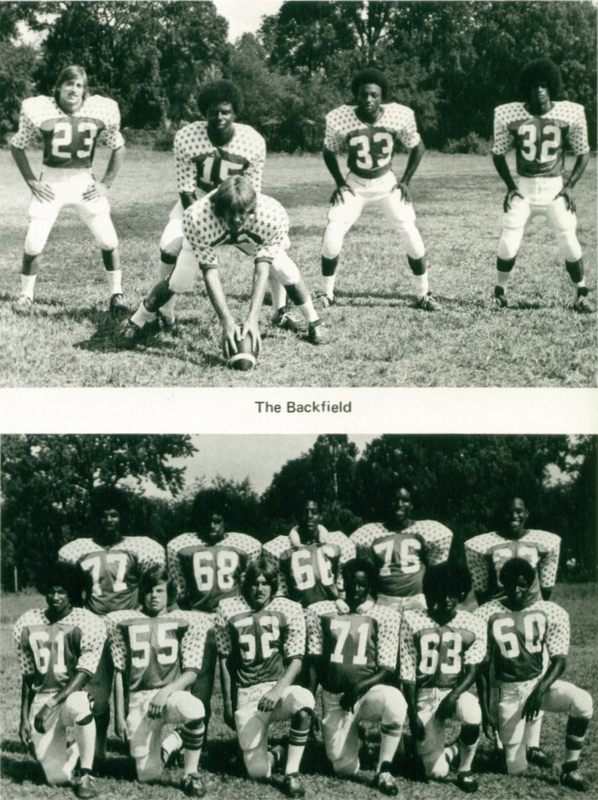 Coached by Jim Sherrill, they appeared to be a group of promising young athletes for the Varsity Team. The Baby Presidents were led by several remarkable players. A few of these were Terry O'Neal and Barry Jones. 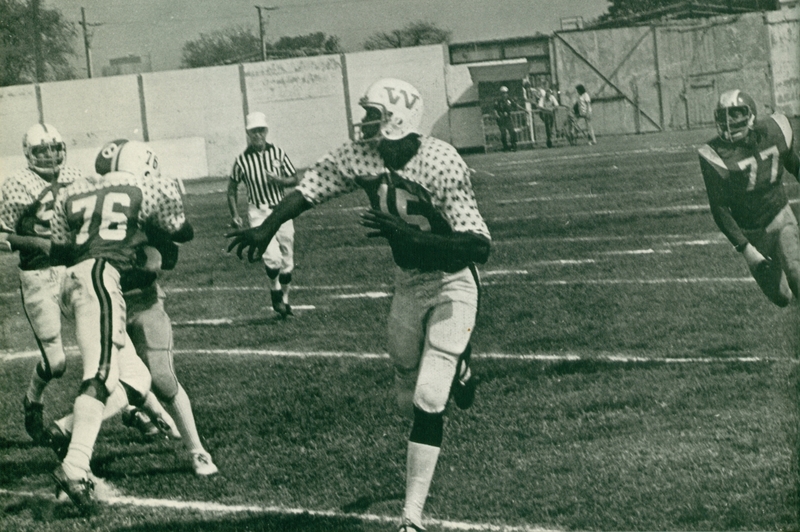 Scoring numerous touchdowns throughout the year, they were a decisive part in many victories. Another key player was Jerome Heath. 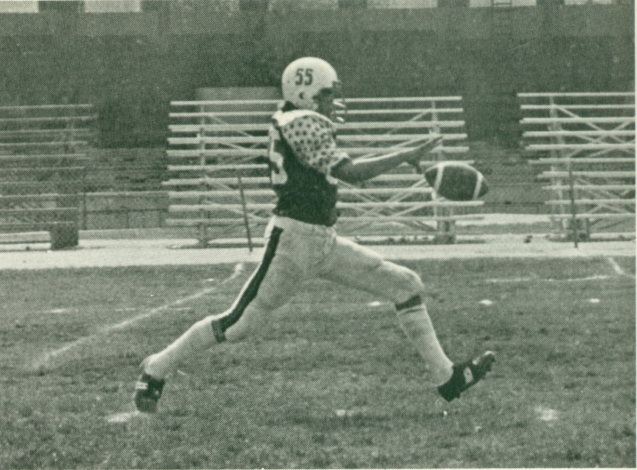 Scoring several touchdowns, he showed his running capabilities in practically every game. 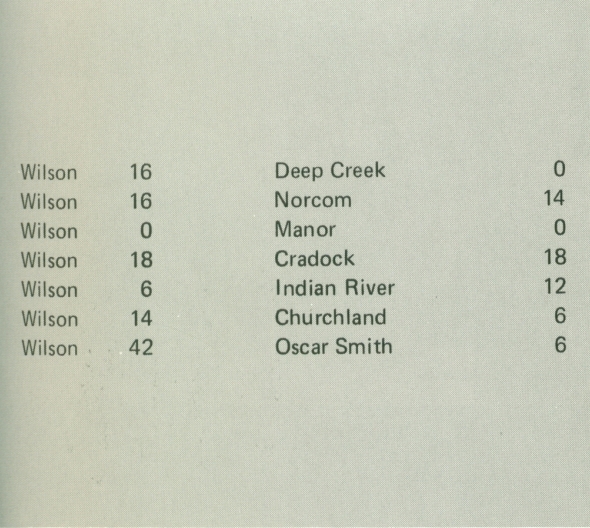 However, his best games were against Cradock, when he gained over 100 yards, and Churchland, when he ran for touchdowns of 60 and 70 yards. Also, the team could not have excelled without the help of their defense. 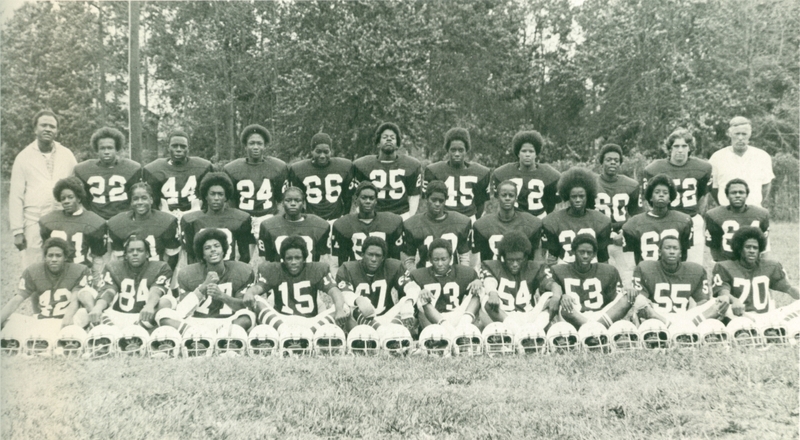 Consisting of several important players, the defensive standouts included .Tony Burgess, Kenneth Rodgers, Keith Jones, Barry Jones, Eddie Johnson, Mike James, and Anthony Wright. "... us the mighty prexies gonna sock it to you! " 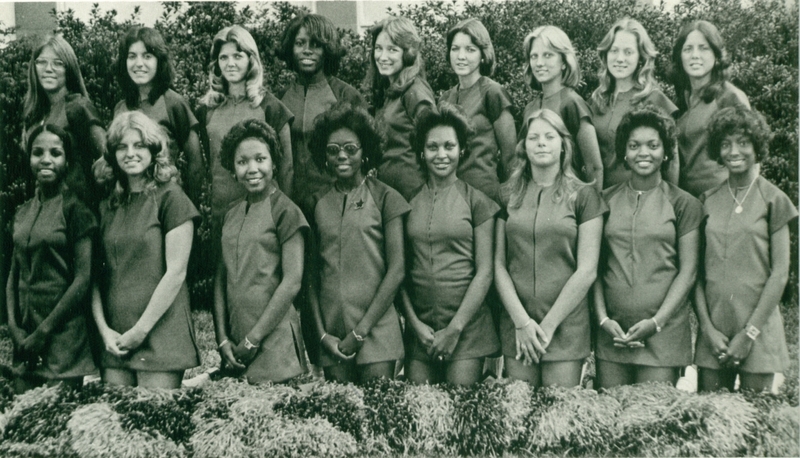 FRONT ROW: Jackie Rooks, Betty Ann Eure, Sharon Anderson, Vernessa Clark, Lisa Howard, Ruanne Kampman, Arleen Person, Denis Hunt. BACK ROW: Brenda Atkins, Loretta Tretola, Tammy Matthews, Wilma-Ricks, Donna Mooney, Colleen McGary, Stasia Krzywda, Terry Guyot, Anita Sumner. Mrs. Robin Ripley. The cheerleaders had various new looks this year. Instead of twelve girls on the squad, there were seventeen. They also made bright, new uniforms. To raise money for extra uniforms, they had two car washes as well as selling Homecoming flowers and jewelry. cheered as if it was the first game of the season. The response they received from the fans was incredible. A losing season made no difference! 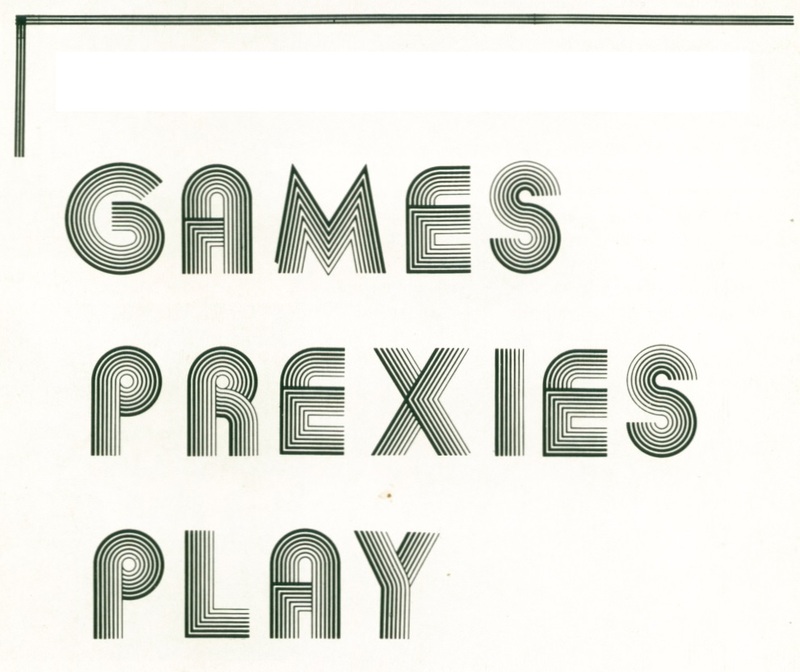 A Prexie is a Prexie, win or lose. previous cheering experience, so the main objectives were perfecting mounts, jumps, cheers, and regaining school spirit. Donna cannot take the suspense. Wilma blows her heart out. 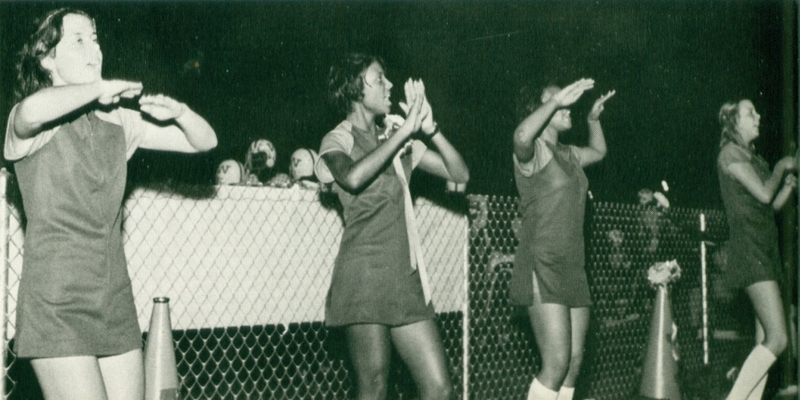 At the Homecoming game; Anita, Denise, Arleen, and Ruanne cheer their hearts out, but to no avail. FRONT ROW: Stephanie Manchur, Karen Garces, Diane Coble, Mary Helen Moon, Robin Davenport, Lynn Rosser. 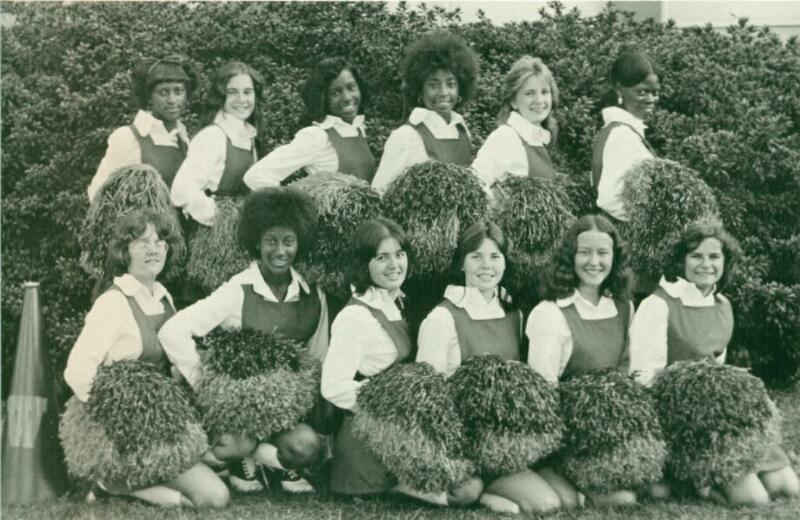 BACK ROW: Denise Martin, Teresa Lewis, Sandra Deberry, Michelle Steele, Pam Parnell, Antionette Johnson. Boosting morale for the J.V. 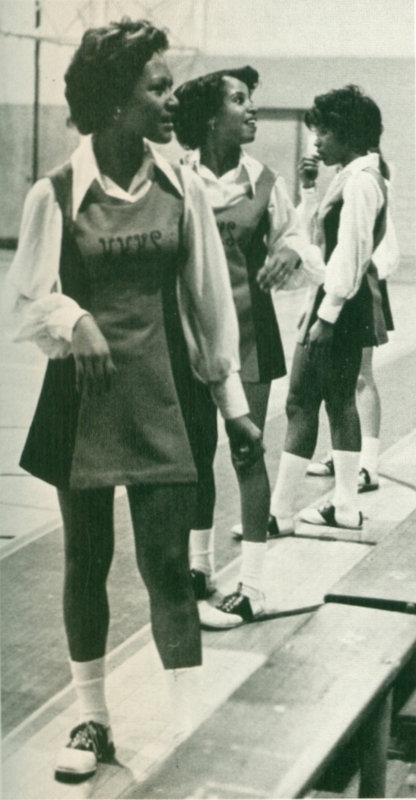 teams were the all new, inexperienced J. V. Cheerleaders. They attended every J. V. Football and J. V. Basketball game there was. 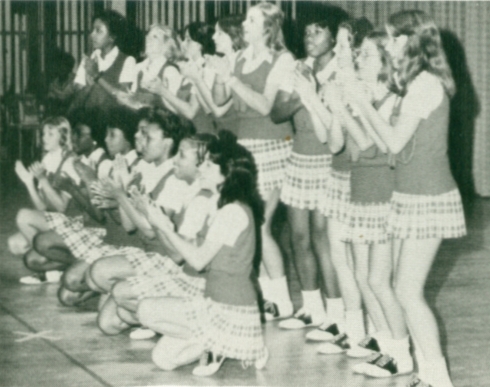 Tryouts were held last April and ten girls were picked. Whether it was because of failures, apathy, demerits or bad grades, only seven girls made it through the summer and returned in September. Therefore, tryouts were held again and eight more were chosen. However, by the end of the year only eight remained, six Freshmen and two eighth graders. 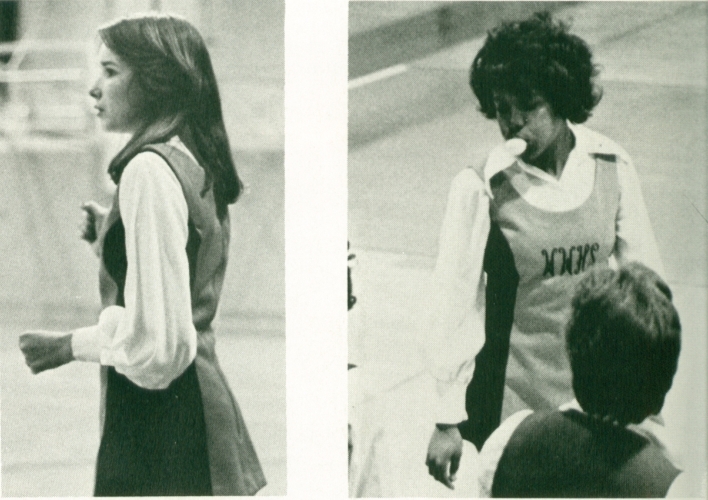 In addition to their cheering duties, they sold programs at the Varsity games, made favors for the J.V. Football players, paid dues, and made new cheering uniforms since the old ones were not fit to be worn. They even had a new sponsor - Mrs. Person - who consoled them when they were scared stiff to cheer on stage. Lisa and Jackie look to the spectators for sug-gestions for cheers. All join in for "Power to the Prexies."